A view of the Andasol 1 and 2, a parabolic through power plants located in Granada, Spain. With a gross electricity output of around 180 GWh per year and a collector surface area of over 510, 000 square meters - equal to 70 soccer pitches - they are the largest solar power plants in the world..Following their construction period of around two years, the Andasol power plants will supply up to 200,000 people with environmentally friendly solar electricity. Photographer: Markel Redondo/Fedephoto.com for Greenpeace.Site de la tour PS10 de la centrale solaire de Sanlucar la Mayor, pres de Seville, Espagne. La centrale solaire, la premiere centrale commerciale au monde, appartenant a la societe espagnole Solucar (Abengoa), peut produire de l'electricte pour 6000 habitations. Solucar (Abengoa) projete de construire un total de 9 nouvelles tours dans les 7 ans qui viennent, afin de fournir 180 000 habitations en electricite. 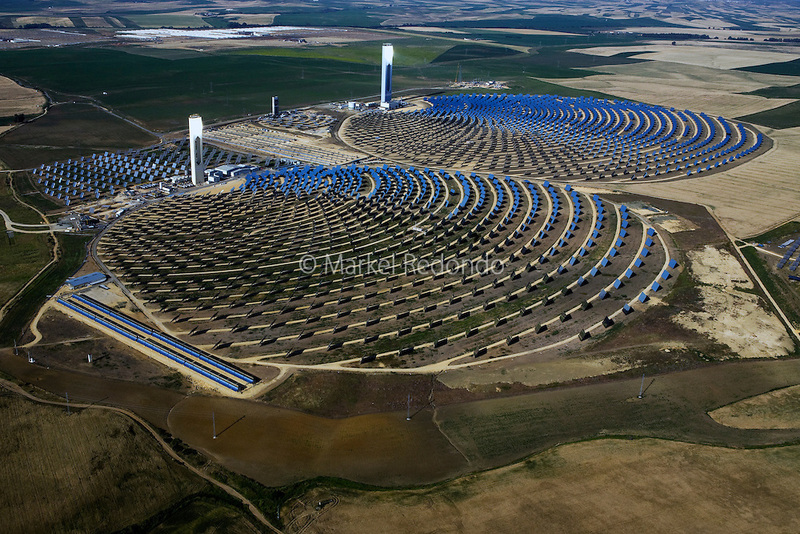 Photographe: Markel Redondo/Fedephoto pour Greenpeace...The PS10 solar tower plant sits at Sanlucar la Mayor outside Seville, Spain. The solar tower plant, the first commercial solar tower in the world, by the Spanish company Solucar (Abengoa), can provide electricity for up to 6,000 homes. Solucar (Abengoa) plans to build a total of 9 solar towers over the next 7 years to provide electricity for an estimated 180,000 homes. Photographer: Markel Redondo/Fedephoto for Greenpeace.